PORTLAND, Ore. – Daimler Trucks North America (DTNA) captured 39.8% of the North American Classes 6-8 truck market in 2017 – a new all-time high for the company, and all of its competitors. And 2018 could be even better. Roger Nielsen, president and chief executive officer of DTNA, said the company is forecasting a total Classes 6-8 market of 420,000 vehicles this year, matching the extremely robust levels last seen in 2015. He said January orders were the strongest since 2006, and February continued to show strength, and may in fact turn out to be the strongest February for truck orders in history. “And of course, we are very satisfied with our level of participation,” he said. In January, Nielsen said, DTNA grew its market share to 42.3%, building on last year’s success. “The new Cascadia continues to be a significant driver of our stronger market share,” he said. DTNA built 151,000 trucks in 2017. Its Western Star brand also achieved a new market share record, and the company is also achieving greater penetration of its proprietary components. Nielsen said 96% of Freightliner Cascadias are ordered with Detroit power, and 75% of Cascadias and Western Star 5700s are being spec’d with the company’s DT12 automated transmission. Nearly 90% of Cascadias are being orderd with the DT12. “If you take a look at the penetration rate, it far exceeds what we expected,” he said. Customers first: Nielsen said DTNA will emphasize a “customers first” approach, meaning a focus on improving uptime. “Uptime is the most critical aspect of managing real cost of ownership,” Nielsen said. The company is designing uptime into its trucks, in the form of longer-lasting LED lights, an improved electrical architecture, and remote diagnostics. It’s also expanding its service network, with 600 full-service dealers in the U.S. and Canada, 270 of which are certified Elite Support dealers. Nielsen said its dealers now complete 55% of repairs within 24 hours, but the goal is to reduce that further, to about 10. 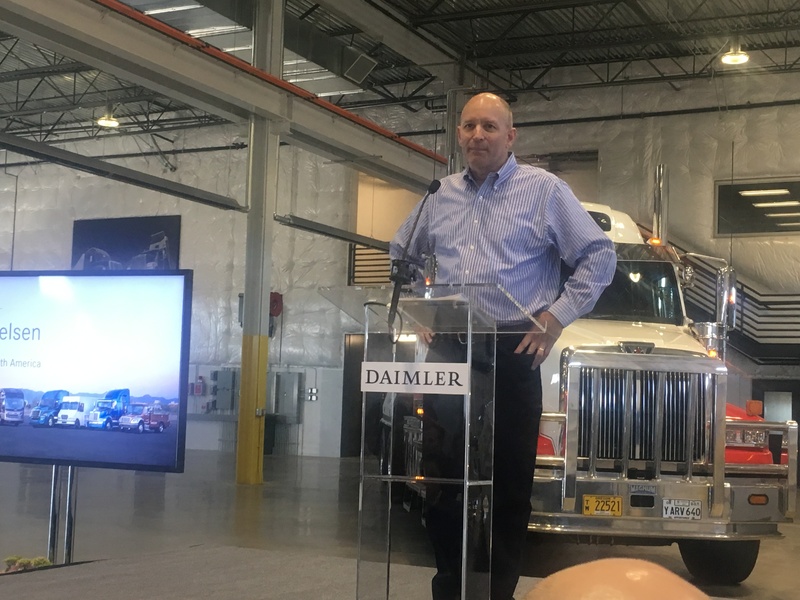 One of the next steps, according to Nielsen, will be developing predictive analytics, which will notify an operator before a breakdown occurs by analyzing data generated by the full population of Daimler trucks on the road. Further integration: Another goal for DTNA in 2018 is to continue growing the acceptance rate of its proprietary parts. In addition to new highs for Detroit engine and transmission penetration rates, Nielsen said customers are now spec’ing Detroit front axles on 73% of their vehicles, and rear axles on 46%. It plans to grow those numbers, while also pushing its new medium-duty engine line. Manage the market cycle: With truck demand soaring, Nielsen said it will be important to manage the market cycle. He feels able to do this, thanks to the flexible manufacturing network the company has established, with multiple plants able to produce each model. “Frankly, part of our task now is to manage the supply chain and make sure everybody keeps pace with the demand we see,” he said. Growing the aftermarket: Nielsen sees the heavy-duty aftermarket as another opportunity to grow. The company is opening another parts distribution center (PDC) in Des Moines, Iowa, which will mean 80% of its dealers are within 350 miles of a PDC. This allows faster delivery times, including same-day delivery for many dealer locations. The company also plans to expand its Alliance Truck Parts line, by opening truck parts retail stores. It will also enhance its e-commerce capabilities to keep pace with the rise in online ordering demand. Leverage global resources and technologies: As a global truck maker, Nielsen said the company must leverage the expertise it has in other markets. Examples of how it has done this in the past include the introduction of engines and transmissions from Europe to the North American market. In the future, said Nielsen, electrification is an area where achievements made elsewhere in the world can be adapted to the North American market. Driving future technologies: Nielsen also said the company will strive to engage its customers, and develop future technologies that help their businesses. And on the subject of technology, Nielsen noted connectivity, electro-mobility, and automated driving will remain a focus for the company. It now offers customers the ability to remotely update engine parameters. Nielsen noted a fleet that would normally require about four months to change the cruise control speed setting on its entire fleet, was able to do so remotely within 30 minutes, without taking trucks into the shop. Nielsen said DTNA also aims to give customers easier access to data, including from third-party telematics providers. For instance, DTNA will offer the services of these providers through its own Detroit Connect platform, giving the customer the convenience of managing just one account. Electrification is coming to Class 8 trucks in North America, Nielsen acknowledged, hinting of announcements to be made in the middle of 2018. When it comes to automated driving, Nielsen emphasized the goal is not to replace drivers. “The main reason we are working on automated driving is not to take the driver out of the cab, but to make driving safer for drivers and the motorists around them,” he emphasized. DTNA will continue to develop advanced driver assistance systems to help improve safety. Platooning, which Nielsen dubs “pairing,” is another area the truck maker is actively exploring. Nielsen said a fleet customer will begin testing the technology on public highways in the coming weeks, using its own equipment, drivers, and freight. But Nielsen stressed such technologies will only find a home where they make sense.